A puzzle game starring Mario and Yoshi. As Mario, swap the plates at the bottom of the screen and the growing towers of enemy blocks will swap with them. Match two enemies to clear them. 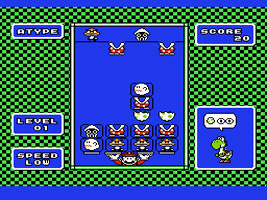 Stack enemies between two halves of a Yoshi Egg to hatch a Yoshi and earn bonus points. The more enemies that you trap provide a bigger Yoshi and more points. You can play an Endless mode and aim for the high score, or Stage Clear to progress through the levels by clearing all the enemy blocks. Yoshi was developed by Game Freak, better known as the developer of the Pokémon games. An endless game. Keep clearing blocks until a stack hits the top of the screen. After 40 enemy blocks have fallen, the speed of the blocks increases. Complete 10 Yoshi Eggs before Game Over and you will see a bonus screen. Enemy blocks come pre-stacked, and you must clear all of the blocks on screen to clear the stage. Played similar to the B Type game, but played with two human players. Clear all of the blocks on screen before your opponent. If you complete a Yoshi Egg, more enemy blocks will fall on the opponent's screen.